This fabulous tried and true fruit blend has so much delicious, natural flavor to offer your taste buds that you are going to feel weak in the knees the first time that you try it. There are some flavors out there that really make for an excellent option no matter what day it is or the kind of mood that you find yourself in and this blend is most definitely one of those options that are going to find themselves becoming that go to juice in your repertoire that is always in heavy rotation. There is a good reason why the tastes that are represented here are considered to be classic and that's because they go together in such an outrageously complementary way that anyone who tries them has to admit that it's scrumptious. If you are a sweet lover who always gravitates towards decadent smoothie style blends, this juice could very well end up becoming your new number one juice for the summer with its balance of fresh and light flavors that will have you satisfied without being bogged down in any way, shape or form. Blu eCigs makes vape juice blends that whose powerful nicotine impact that is going to hit all of the right spot. All of this collections blends are extremely high quality and well put together so whenever you inhale, you know that you are going to be in for a completely cohesive experience that won't have you looking for more. Mango Apricot combines a mixture of freshly picked, perfectly ripened mangoes with a dollop of silky smooth, apricot juice. 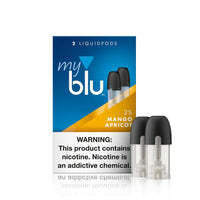 MyBlu Mango Apricot Liquidpods (2 Pack) - Blu has a rating of 4.8 stars based on 4 reviews.